Full-range monitoring is all well and good, but many engineers swear by the use of a secondary 'grot box' monitor system. Here's a roundup of some of the contenders. 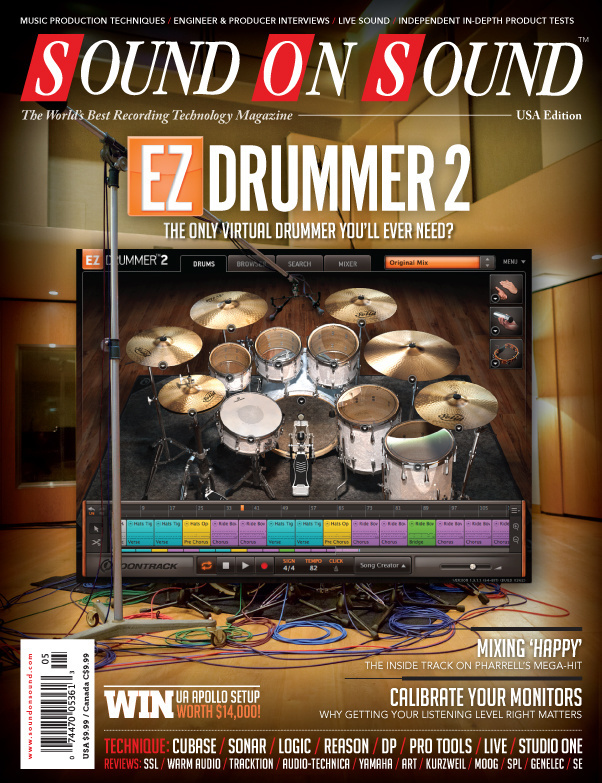 This month's Apps include: Sonoma Wire works GuitarTone 2.2, IK Multimedia GrooveMaker 2 and the Peterson iStrobosoft. This combination of preamp and Auto‑Tune processor could be just the thing for adding a radio‑friendly sheen to your live performances. Elektron have followed up their Analog Four with a fully fledged analogue keyboard. Don't be fooled by its diminutive dimensions: this powered monitor from Italian company FBT punches way above its weight. Genelec's eco-friendly approach to monitor design continues, with the launch of the new flagship M Series speakers. Innovation in synthesis is alive and well — and can whip up extraordinary sounds at the touch of a button. Latvian mic specialists JZ aim to bring their distinctive design and quality sound within reach of the masses. Have they succeeded? Mackie's DLM range of compact PA speakers has gained a subwoofer. We see how it fares as part of a full-range system. Although they're intended mainly for guitarists, modular knob twiddlers could also find plenty to like about Moog's new pedals. This unassuming processor reminds us how much fun can be had playing with distortion and filters! If you need authentic‑sounding robo vocals or a passable imitation of Stephen Hawking, look no further than Roland's VT3. SE's first back-electret microphone offers impressive performance at a surprisingly low price. An SSL analogue mixer with automation and both DAW and iOS integration — all packed in a 2U rack space. What's not to like? U‑he's Satin is one of the most comprehensive tape simulations yet devised. This is far from being the first clone of a UREI 1176 FET compressor, but it's probably the cheapest to have hit the production lines. Is any of the classic sound sacrificed in Warm's cost-cutting quest? There's much more to this mixer than meets the eye, thanks to some cleverly incorporated digital technology. This desk combines three 4U‑high equipment bays at the back of the desk, with a deep monitor surface above, and a sturdy keyboard shelf below, capable of carrying an 88‑note master keyboard. We round up the pick of Reason's Rack Extension dynamics processors. If you're serious about recording and mixing you need to set a consistent reference level to which you can always return. Our seven‑step guide explains how to do it. We look at Live's unusual Collision instrument and associated Corpus effect. Get creative with sends and buses in Sonar X3. Mixing strings in rock music: our engineer follows up last month's string‑recording session by describing how he integrated those strings into a full‑on rock mix. In the final part of this series, we develop a basic chord sequence into something more elaborate. Understanding DP's projects and sequences can help you develop, archive and protect your hard work! Studio One's Sound Sets are the perfect vehicle for sharing samples and sounds. Familiarise yourself with some basic concepts, and you'll be up and running with Pro Tools in no time. This month we discuss tracks from Disclosure, Naughty Boy, Tom Odell and our Classic Mix is Bonnie Raitt's 'I Can't Make You Love Me' from 1991. Create killer sounds with Logic Pro X's Retro Synth. I'm writing this column in February, and here in the UK, half the country seems to be flooded — so terms like 'SOS' and 'Rescue' have taken on a far more serious connotation. His role as producer of The Blues Brothers soundtrack left Bob Tischler in charge of recording some of the best musicians of the 20th century, while managing conflicting shooting schedules and coping with the day-to-day effects of John Belushi's prodigious cocaine habit. Inside Track: Pharrell Williams "Happy"
The biggest hit of 2014 is a triumph of minimalism — and a triumph for mix engineer Leslie Brathwaite. Read more about Inside Track: Pharrell Williams "Happy"
Consisting of two big-name producers, a Hollywood composer and an academic — plus masses of modular gear — Node are the ultimate synth supergroup. This month we review to music from Gertrude,Tycho, Richard Pinhas, Daniel Trigger, Contemporary Dead Finnish Music Ensemble, Andrew Maxwell Morris, Michael Lee and Rebecca Shearing. Jazz quintet Polar Bear have always been musical adventurers, and their latest album extends their experimental philosophy to studio techniques. In many ways, there has never been a bigger or better time for dance music. Want to be a superstar DJ? Join the queue. Q. Why do Universal Audio restrict the processing bandwith of their UAD plug-ins? Read more about Q. Why do Universal Audio restrict the processing bandwith of their UAD plug-ins? You can't please all of the people all of the time. Even when they are on the same production team. Neil Young's new company Pono Music promises a lot — but can it deliver? If recording studios were viewed the same way as wine, 1958 would be seen as an exceptional vintage. Media content for the May 2014 issue.